I recently read in the press that a number of websites are offering people the option of carrying out their own orthodontic work at home. Some websites offer people the chance to send a ‘selfie’ photograph, which they have taken on their mobile phone and they are then assessed. Following the assessment, if the person is deemed suitable, then upon payment of a fee, the person is sent the brace appliance direct. A full clinical examination by a trained clinician is necessary to decide if orthodontic　treatment is in the best interests of an individual. There are a number of different types of orthodontic appliance with different advantages and risks. 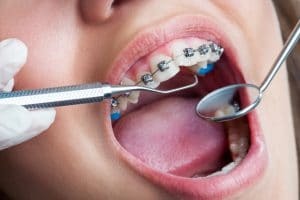 Those considering braces need to be aware of the choices available to them and also to understand the risks of treatment. Unsupervised treatment will at best result in a compromised result and　at worst may cause damage resulting in expensive dental problems or even early tooth loss. A relapse, where the teeth return to their original position, this may be because the treatment was too quick or not suitable for that particular patient. Having to undergo further treatment as certain teeth were not extracted prior to starting the original treatment. Any dentist can carry out orthodontics provided they feel competent to do so. However, orthodontic treatment is a specialised area and only those dentists who are registered on the orthodontic specialist list with the General Dental Council, can call themselves a specialist orthodontist. Therefore, it is highly recommended that if you are considering orthodontic work, you should ensure that you seek appropriate advice when deciding to get a brace, and should attend a consultation with an orthodontist or a specialist equipped with the experience and expertise to carry out orthodontic work. A treatment plan should be devised and you should be advised of your options, what the treatment will involve and the cost. Whilst certain websites may offer a quick fix and be a cheaper alternative, the overall outcome could be damaging to a person’s dentition.